Cirracore Enterprise Cloud, today announced that it has partnered with Transformation Solutions, LLC to help enterprises move workloads to the cloud. 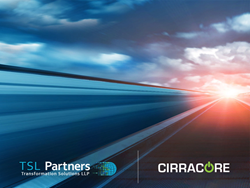 Cirracore provides a secure VMware® vCloud Air based cloud that allows enterprises to directly connect to their cloud without traversing the Internet. Transformation Solutions (TSL Partners) provides a full range of services from planning, discovery, design and implementation of migration services. “As more and more enterprises embrace moving workloads to the cloud, a partner like TSL Partners can provide the broad range of services to successfully migrate them. We’ve seen customers of all sizes from SMB to large enterprises either not had the resources or expertise to take on a complex project to migrate to the cloud”, stated Fred Tanzella, CEO of Cirracore. “TSL Partners are specialists in rapid Zero Defect / Zero-Downtime cloud transformational migrations with deep expertise in small and large-scale transformation projects. We utilize a custom migration methodology for moving workloads from existing data centers or cloud application workloads that is modular and scalable. We can scale the methodology for workloads as small as 25 servers or enterprise environments up to 10,000 plus workloads. Our process methodology coupled with the portfolio of toolsets we utilize enable us to deliver the analysis requirements and migration execution elements necessary to achieve zero defect and zero downtime workload migrations”, stated Jeff Rupert COO of TSL Partners. Cirracore is a provider of VMware-based Enterprise Cloud Infrastructure as a Service (IaaS), Disaster Recovery as a Service (DRaaS), Managed Cloud Services, and Cloud Backup serving a global customer base. Cirracore provides Virtual Private Data Centers with dedicated resource pools for customers that need tighter security and control in their cloud. Cirracore is carrier-neutral with access to 180+ network providers to provide “on-net” Enterprise Cloud resources that do not traverse the Internet. Additionally, Cirracore provides white-label Enterprise Cloud services to major telecom carriers and solution providers that offer IaaS to their customer base. TSL Partners is a small, highly experienced consulting firm delivering focused IT transformational strategy, planning, advisory, IT blueprinting, DR, and migration services. Our principal consultants are among the most tenured IT resources, having been in IT Executive, Engineering and Architecture leadership roles each over 35 years. We deliver on behalf of all the large IT firms as the SME resources in many global programs, and now deliver the same highly experienced consulting and advisory services at lower costs and with more client focused approaches. Among our depth of highly successful outcomes are consulting in focused expertise in IT advisory services in IT strategy, IT transformational program strategy, development, and business case formulation, IT Architecture, Cloud enablement and migration planning services, IT blueprinting, and leading both small and large-scale enterprise IT and Data Center migration services. We have the experience, advanced toolsets, and proven vision to plan, strategize, roadmap, and deliver from the smallest IT migration projects, to the largest enterprise IT transformational programs.